Can I speak directly with the client? RecruitiFi provides a robust communication system for candidate and content inquires. In an era when every new technology is trying to disintermediate and reduce the human element, we encourage you to communicate with employers. There are two areas to get more information about your candidates and JobCasts. Chat -- which becomes available when your submitted candidate is moved to the 'Screening' stage. 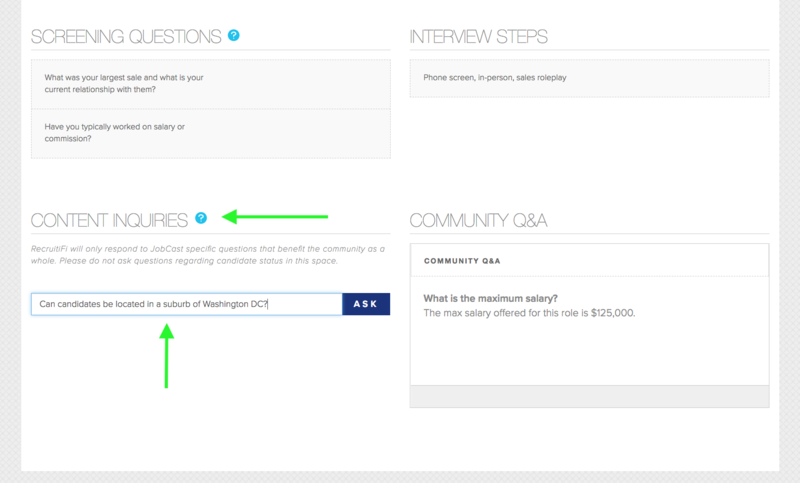 Content Inquires -- which is available to you as long as you have 'Accepted' to work on the JobCast. Simply scroll to the bottom, and you can see a list of questions that have already been asked. If you are a Legacy vendor, you may continue to communicate with your contacts as you have been doing in your relationship. However if they ask that you drive conversations back to the Employer chat area you should abide, as they have engaged with RecruitiFi to consolidate communications and submissions. If you are a Community vendor, we ask that you communicate with the client through the platform, unless the client wishes to speak with you elsewise.